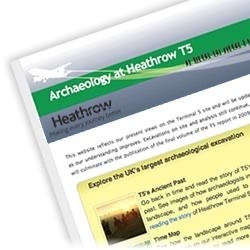 Framework Archaeology is a joint venture of Wessex Archaeology and Oxford Archaeology set up to work at airports. Since 1998 we have undertaken large excavations at Heathrow Terminal 5 and Stansted. In addition we have carried out archaeological evaluations and smaller excavations at Gatwick, Southampton and Edinburgh airports. News (March 2011): The second and final volume of the Terminal 5 monograph is now published and available from Oxbow Books. News: Join venture wins award. News: The Stansted Airport excavation data is now online, and a new book is available from Oxbow Books.